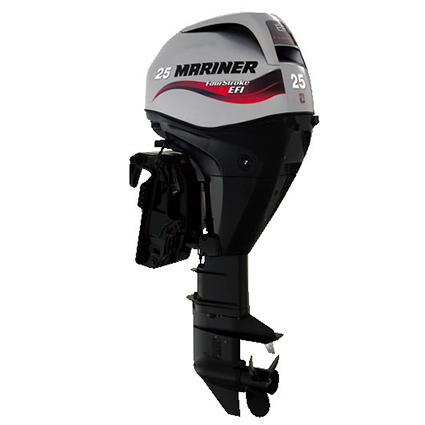 This is a three cylinder 4 stroke outboard engines and is rated at 25HP EFI for this long shaft Electric start Power Tilt outboard engine. This is the smallest of the EFI (electronic fuel injection) engines which gives impressive fuel economy and is also the smallest of the 3 cylinder outboards. All electric start models feature a manual recoil starter for peace of mind and safety in the case of a drained battery. Sequential EFI independently calibrates the exact amount of fuel needed by each cylinder, for unmatched smoothness, turn-key starting and instantaneous throttle response. It comes with a 15 amp/186 watt alternator. Tuned air intake runners eliminate water intrusion and greatly reduce noise levels. Throttle Only feature delivers easy starting in the rare case that the engine floods.